Description: Kenne Bell, The Innovators, have done it again: An ingenious, reliable yet simple solution to your fuel system needs. 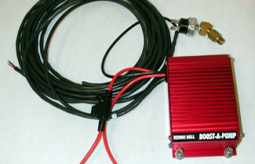 Just tap into your existing fuel pump wiring. Imagine 50% more fuel delivery and horsepower without the hassle and expense of draining and removing the gas tank, tapping into fuel lines or adding a noisy in-line pump - and it doesn't heat the fuel up. No longer are you "locked in" to a fixed pump capacity and/or pressure. It activates ONLY at full throttle (naturally aspirated) or at 3 psi (turbo or supercharged). And it acts as a voltage regulator by compensating for any and all system voltage fluctuations.